I have mentioned this is several previous posts, but never written about it directly. For Christmas, my brother gave me True Brews, a wonderful, really accessible book about home brewing. The author, Emma Christensen, is pretty cool because she’s also down to earth. She isn’t advocating buying enough specialized equipment to fill a garage, but merely enough to get the job done properly. The first recipe that I tried from her book was Ginger Ale (non-alcoholic). It was MARVELOUS and super simple. Look for another post soon on the refreshing qualities of fresh “soda”, but without all the sugar and chemicals found in the store bought kind. I know, soda without chemicals… (?!????). It’s a mind-blowing idea. But I promise. It exists. And I’ve had a frosty glass full of it. Then I got a little cocky, and a little enthusiastic, and decided to try something a little harder. I went with Hard Apple Cider, because my boyfriend is obsessed with all things apple, and I knew that even if it was borderline inedible (or undrinkable? Grammar police, fight it out), he would force it down, thus saving me from the tragedy of having to try to feed three gallons of it to friends or unsuspecting houseplants. Upon revealing my plans to my boyfriend, he predictably upped the ante: why not juice our own apples with his beloved Omega 8006 juicer (yes, I know the exact model number because it is trumpeted gleefully from the kitchen about once a week as he chokes down a noxious blend of beets, kale, celery, and other “good for you” things). Thank god for apple slicer/corer. 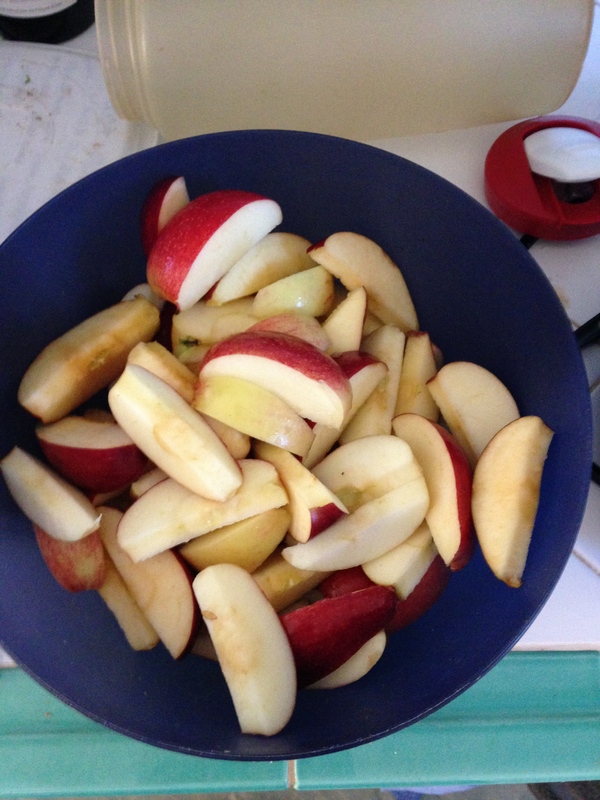 Otherwise I might still be slicing apples. So, the basic principle of hard cider is that you dump a bunch of apple juice (de-pulped for convenience more than anything) into a sterilized primary fermenter, chuck some yeast in on top of it, pop the airtight lid on and wait. I am not going to share the exact recipe with you because its Emma’s, and you should buy her book, and also, it really is just that easy. Our first batch was made with champagne yeast. This yielded a delicate bubble that is more of an afterthought than anything, and we have a second batch in now with liquid cider yeast. This promises to be fizzier. Anyway, you pop it in the primary fermenter for about two weeks. I use a food-grade plastic bucket with a pre-drilled hole for an airlock (which helps relieve pressure as the yeast chews happily away on the sugar from the apples). After that, you siphon off the immature cider from the gunk on the bottom into a secondary fermenter. 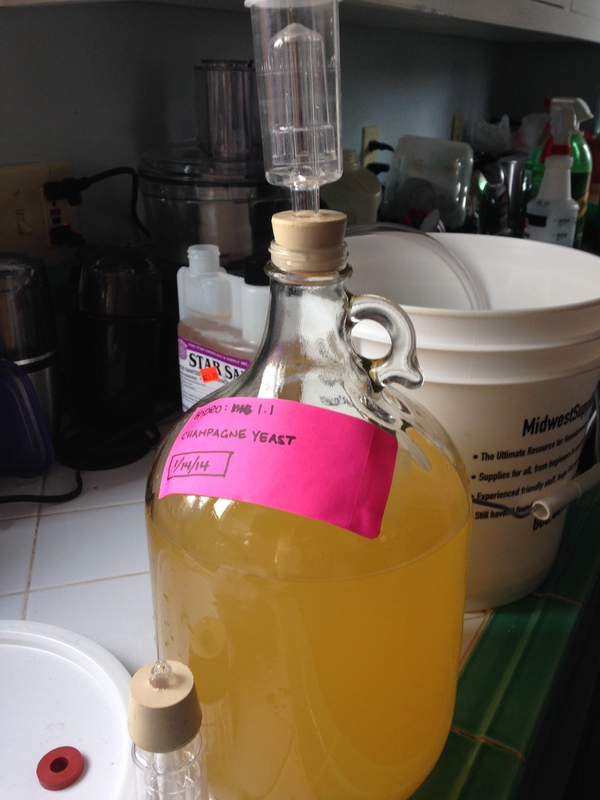 I use a glass, 1-gallon jug with a cork that has an airlock on it. Airlocks are essential for peace of mind…they help prevent the explosions everyone tells you are rife in home brewing. Here you can see my primary fermenter in the background and my secondary in the foreground. The airlock is attached to the top of the secondary. ** If you want to actually make this recipe, I strongly suggest buying True Brews or another brewing resource. Endless valuable information, and I don’t want to take money away from the actual brains behind the operation by reproducing the recipe here. 1. Sanitize your equipment: your primary fermenter and lid, your fine mesh strainer, your juicing equipment. 2. Juice the crap out of a lot of apples. I made just over a gallon of apple juice to start with. 3. If you are juicing your own, I recommend a secondary pass through a fine-mesh strainer to catch most of the goo. It helps make a clearer cider. 4. 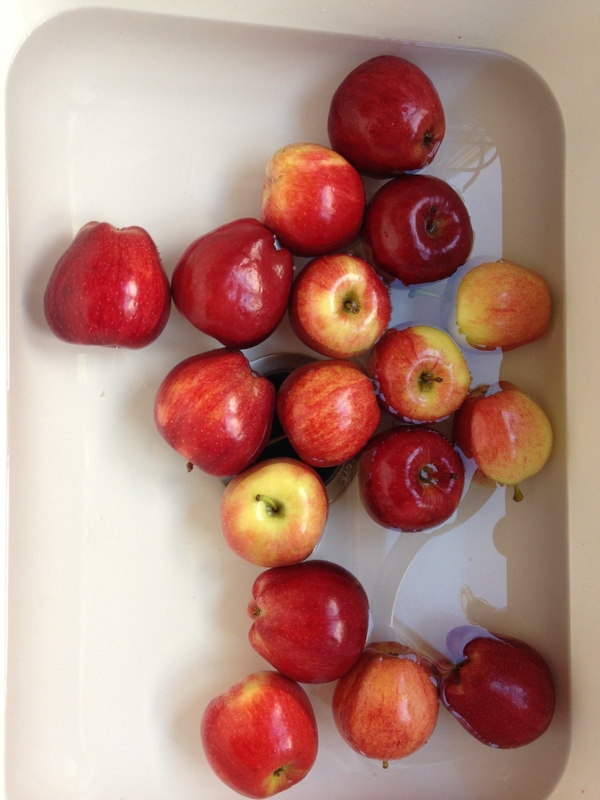 Dump the apple juice in your sanitized container. 5. Pour some into your graduated cylinder, too, and take a hydrometer reading. This will be your initial hydrometer reading, and should be somewhere between 1.05 and 1.10. 6. If you’re using liquid cider yeast, this is where I got discouraged. You have to make something called a yeast starter. Scoop out about a cup of your apple juice into a clean and sanitized jar. Add your cider yeast and let it stand. According to my recipe, it was supposed to stand for 1 to 3 hours. 3 hours later, my yeast was still in a stunned stupor. It took TWO WHOLE DAYS for my yeast to wake up. I believe the problem is related to the term “room temperature”. My house is kept fairly arctic, so when I popped this and my sourdough starter, etc., into my oven with the light on (approximately 100 degrees), the yeast went NUTS. The lid on the top of the canning jar was puffing out, so I added it to the apple juice posthaste before something bad happened. 7. Once your yeast starter starts doing cartwheels (you should see foam and tiny bubbles moving around), add it to your apple juice with your pectic enzyme, yeast nutrient, tannin, and acid blend. Stir vigorously to aerate the juice (gives the yeast extra oxygen to go crazy with). 8. Put your lid on and wait. Somewhat patiently. For 1 week. 9. Siphon your cider into a sanitized secondary fermenter, taking care to leave as much of the goo/sludge from the bottom in the primary fermenter. 10. Pop your cork on and let it sit in your closet for another 2 weeks. Now, ours was a whopping THIRTEEN PERCENT. One bottle and I couldn’t feel my face anymore. But it was deeeeelliiiccioouuusssss. So I had a second bottle anyway. I kind of just threw it in the general direction of my face since I couldn’t feel my lips anymore. And there you have it! That wasn’t that hard, was it? *Don’t get frustrated if your cider yeast doesn’t go off right away. Like I said…mine surprised me by going nuts 48 hours later. Lazy little bastards. *Recommended are the flip-top reusable glass bottles. Or drink it right out of the jug. *Don’t worry if you don’t see bubbles in your airlock. I saw exactly zero bubbles in either airlock, and it still worked out great. *Buy Emma’s book! She’s great! 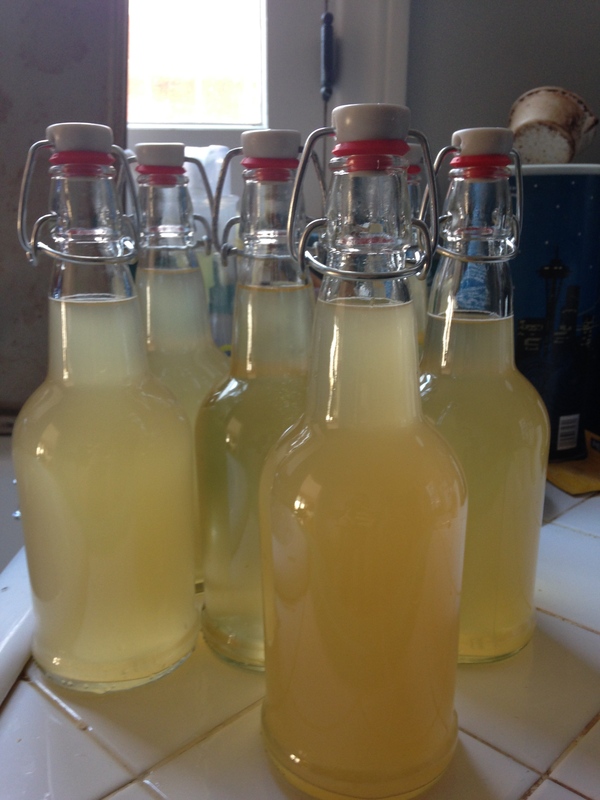 *Stay tuned for my post on ginger ale and other alcoholic and non-alcoholic brewing adventures! !